One thing I noticed while researching my article about Q Workshop’s “Halloween” and “Bloodsucker” dice sets was just how many licensed dice sets they produced for big name role-playing games. With official dice sets for Pathfinder, Numenera, Fudge, etc., it’d probably be easier for me to list the major RPGs Q Workshop doesn’t produce dice for! Thankfully, Chaosium’s Call of Cthulhu would not fall on such a list! In fact, Q Workshop has a huge selection of styles to choose from! In addition to the black and green set I’ll be reviewing today, they also offer the same design in beige and black, black and glow-in-the-dark and green and glow-in-the-dark colors. They also have metal Call of Cthulhu dice (designed by the creator of the “Halloween” dice set), light blue Azathoth dice, yellow Hastur dice, red Nyarlathotep dice and dice based on the legendary Horror on the Orient Express campaign which come in a black and purple design. 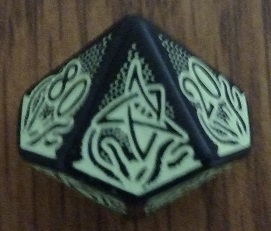 I must stress each one of these sets has its own unique design and how they are not simply the Call of Cthulhu dice design with a new color scheme. There’s even a green and black “Outer Gods” Cthulhu variant featuring a different Cthulhu design! Although the exact numerical value of the Elder Sign might change from die to die, the excitement felt by anyone who rolls it will always remain the same. Just remember: the highest score is replaced by the Elder Sign on each die. I made several test rolls of each die on a soft surface, which revealed no balance issues or “bias” when it comes to a particular number. As always, Q Workshop’s polymer dice feel light without feeling overly light. Those who wish to extend the life of their dice should consult the resources I provided in a previous dice review. Or you could buy an extra set. I bring this up because, in honor of H.P. Lovecraft’s birthday, Q Workshop is offering a today (8/20/18) only sale in which you get a free Call of Cthulhu dice tower if you purchase any two Call of Cthulhu dice sets! But don’t fret if you missed the sale, as you can still buy the dice tower separately. 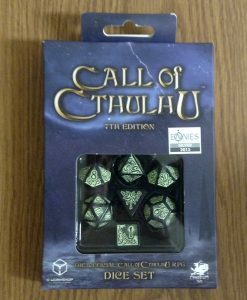 I should also note how the packaging for the Call of Cthulhu dice sets might differ from mine. I received an older set which housed the dice in a fitted plastic tray, but was informed by Q Workshop how the newer editions have the dice loose in the package. I hope they consider using something like cardboard strips in the future in order to keep the dice from potentially getting damaged during shipping. Of the three Q Workshop dice sets I’ve reviewed, I think the black and green Call of Cthulhu dice are the easiest to read. Sure, it might be a bit more difficult to read them from a distance, but that won’t be an issue if you’re the game master and roll them at your players. Given how Mythos creatures appear in games like Dungeons & Dragons and Pathfinder (among many other non-Mythos games), it could be fun to save using the dice for encounters with such creatures. This becomes even more fun if players botch their rolls and get “caught by surprise” by the monster. Imagine telling them they’re being attacked and how you’ll give them a hint about the nature of their foe even though they failed there respective rolls. The look on their faces when one (or more) of these dice comes rolling at them will be priceless! But these are a worthwhile purchase for any Lovecraft fan, even if they don’t game. The designs really are cool enough to justify their purchase. But if you do plan on gaming with these, odds are you’ll want to use them with Call of Cthulhu. Sure, you could use a few of them while playing something like Cthulhutech, but why only use a few Cthulhu dice when you can use them all? Thank goodness Chaosium offers so many free downloads to get you started. The 7th edition freebies are a perfect match for these dice, given as how they are licensed for the 7th edition of Call of Cthulhu. There’s plenty of fan-created scenarios for you to enjoy as well. “Raid on Black Goat Wood” is a revised version of an award-winning One Page Dungeon. There’s plenty of other single page scenarios for Call of Cthulhu over at Reckoning of the Dead as well! But if you want something you can really sink your teeth into, make sure to purchase some of Chaosium’s published adventures. Considering how The Fungi From Yuggoth spawned a licensed audio drama adaptation, Masks of Nyarlathotep brought us a prop pack and Horror on the Orient Express resulted in both a dice set and a soundtrack album, how can you not be curious to try them out? But now we come to my favorite part: the use of these dice in a homemade haunted house! Although I had discussed using dice in a Cthulhu cultist room before, I’ve since realized the idea had far more potential than I had given it credit. So, since Q Workshop originally gave me the idea to use RPG dice in haunts, let’s give that room idea an upgrade. Let’s keep the basic idea of people entering a room filled with fake candles, sinister idols and eldritch tomes and do something about the cultist’s costume. Originally, I had assumed a hooded robe would be enough for a costume. But after having seen some elaborate fan-made cultist costumes, I realized a simple hooded robe was just not enough. Although I was unable to find any tutorials for any cultist costumes or masks, I was able to find instructions for an amazing wizard costume which could easily be modified into a Cthulhu cultist outfit! Don’t let the word “wizard” fool you, this isn’t your standard “purple robe with stars and a pointy hat” getup. This sort of wizard looks menacing even before you change the lightning bolts to tentacles (and add other Lovecraftian symbols). Using makeup to create an eerie look is much easier than trying to create a molded leather mask (and much less expensive). Having one or more of Q Workshop’s Call of Cthulhu dice bags hanging from the costume would further enhance the overall effect! I think the white or black one would be better looking than the one with the color illustration, but in the end the final choice is up to you. Save wear and tear on your dice bags by not having the cultist store dice in them. Q Workshop sent me a catalog with a picture of an upcoming wooden Call of Cthulhu storage box. Having the cultist carry them out in that would make for quite a scene. Unless, of course, you wish to have the cultist remove them from a book safe or have the dice sitting out in the open. Just be sure to have the cultist close by so nobody can walk off with them. Using a black light to make them glow is still recommended, unless you opted to by the glow-in-the-dark versions. Then you have the option of using a black light or having the person playing the cultist “charge them” using a hidden flashlight while waiting for the next batch of guests. Using these particular dice adds more to the scene thanks to their not being standard d6s. Everyone is familiar with those, but polyhedral dice will seem much more exotic and otherworldly. Their odd shapes and many angles are closer to the non-Euclidean geometry made infamous by H.P. Lovecraft. Your haunt’s cultist might even take a page out of “The Dreams in the Witch House” and mention how what seems like mystical sigils are actually complex mathematical equations. Suddenly the idea of a Cthulhu cultist rolling dice to predict the future makes much more sense! They could even use Q Workshop’s leather dice cup featuring the Chaosium Elder Sign to further sell the effect! The response will be the same no matter what number the dice land on, but it’s even better if they come up showing the same symbol which appears on the cup they were rolled in! Even guests who are completely unfamiliar with the Cthulhu Mythos will know that’s bad news for them. Now let’s look at how the cultist will deliver the bad news. I guess a Cthulhu cultist might warn people that they’re doomed, but it would make much more sense to have the cultist announce the roll of the dice (or die) means the visitors are the perfect sacrifices? The cultist can either menace them with a fake dagger or “stab” a fellow haunt actor who has been planted in with the visitors using a gag knife with a retractable blade. Make sure the “plant” is wearing dark clothing to cover for the fact they aren’t bleeding. Testing the gag dagger beforehand is highly recommended, as some models can be fairly pointy and would require the use of padding and old clothes. You should also buy a few spares just in case your dagger’s special casing breaks after repeated use (which seems to be a common complaint in reviews of some models). So whether you’re an avid gamer or horror fan (or both), you owe it to yourself to snag one of these dice sets for yourself! You’re just cheating yourself out of tons of potential fun if you don’t. Special thanks to Q Workshop for the review copy!